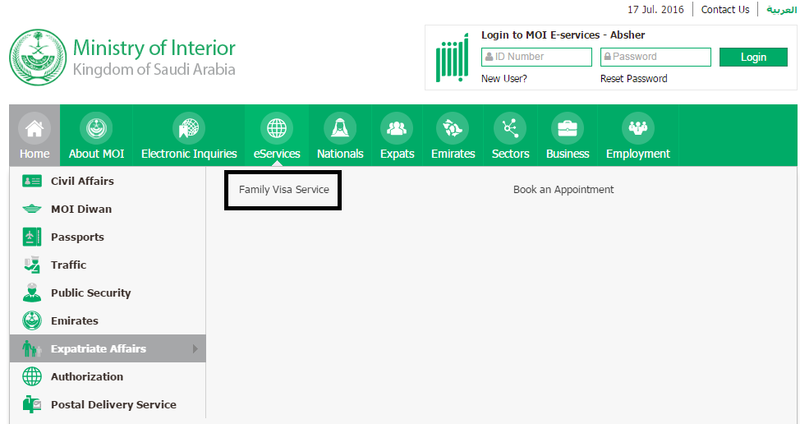 MOI Saudi Arabia introduced online family visa application service which lets expatriates to fill and submit visa application online through their moi Absher account. The main difference is that in this case expatriate do not have to go to office for application and other thing. He can sit in his room and using it absher account could fill his online application. After filling he have to go through istiqdam appointment and at last he will get his permanent family visa. Also you’ll also get online istiqdam appointment, Check how to get Istiqdam appointment online. The procedure of online application but if you still not comfortable with this procedure tries to do manual procedure of application. TO get Permanent family visa, applicant must have to pay government specified fee for permanent visa which SAR 2000. 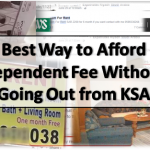 This fee could be paid through SADAD payment System. For you have to visit ATM from where applicant transfer money to his online Absher account. Also the payment is also be made from your Online banking Account. 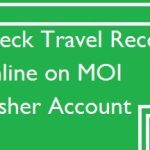 As you know about Absher MOI service which let you to do transactions and application for many services related to iqama, visa and other applications. If you have Absher Account Login to account than follow the below procedure. The official language of MOI website is Arabic. Change in to English from Top let corner of the website. 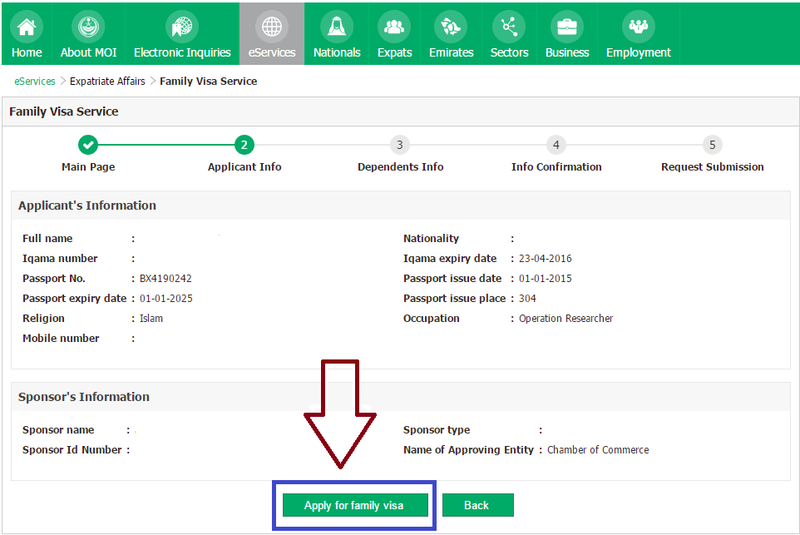 From the drop down list click on Expatriate Affairs after that click on Family Visa Service. A new page show instructions for Istiqdam Family Visa Service Must Read the Carefully and the click on New Family Visa Application. On next stage the page show overview of Applicant Info that is Full Name on iqama, Iqama id, Passport No., Passport Expiry Date, Religion, Mobile Number, Nationality, Iqama Expiry Date, Passport Issue Date, Passport Issue Place and Profession on your Iqama see the information and apply for Visa. Once you click the page redirects you to Online Application Form but in case something is wrong you will get some error one of the most common error is “Your Application cannot be processed because Istiqdam e-service Business rules have not been covered” This error means that those condition you see in previous stage is not fulfilled. 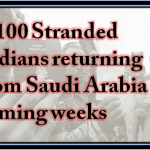 Iqama validity is less than 90 days, or Having profession not eligible for Permanent Family Visa. If the page lets you to go to Online application page than here you several fields which you have to fill accurately. You have to ADD dependents one by one first fill the details of first dependent such as nationality , name, Religion, Age and sponsor relation with dependent. After filling all the fields click on Add New Dependent. Now Tick the check Box of Term and Conditions. Click on Submit application. A new page is opened ask you to Print The Application or View it NOW. The procedure of Online permanent Family visa Application now completed it time to get attested it from Sponsor and chamber of commerce. Take print of application to Sponsor and get stamped. 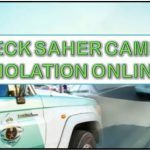 Go to your respective chamber of commerce where your sponsor is registered give them application for attestation after that they stamped you application. The attestation must be a completed in 30 days as after that your online application is expired and you have to submit new one. I just wanna ask if recently someone here already try to apply permanent family visa online because for me it didn’t work even I fulfilled all the pre-application requirements i.e. my iqama is just renewed, application fee is paid, I’m engineer by profession and Iqama but still during process of application this message appeared ” Your application cannot be processed; because it does not fulfill Istiqdam e-service business rules” so I want to know if it happen to anybody also or simply online application is not working itself? Your inputs are very appreciable. Regards. What are Salary Delay Fines on Employers in Saudi Arabia?